Incorporating the right covered porch designs to your home renovation project can surely enhance the look of your home and increase the value of your property as well. But beyond the aesthetic value, having a covered porch also comes with a lot of benefits. With a covered porch in your front yard, your home will be protected from outdoor elements such as the rain and sun. Your front door, entryway lighting, hardware trims and even your foyer will be kept away from the damaging rain and sunrays. 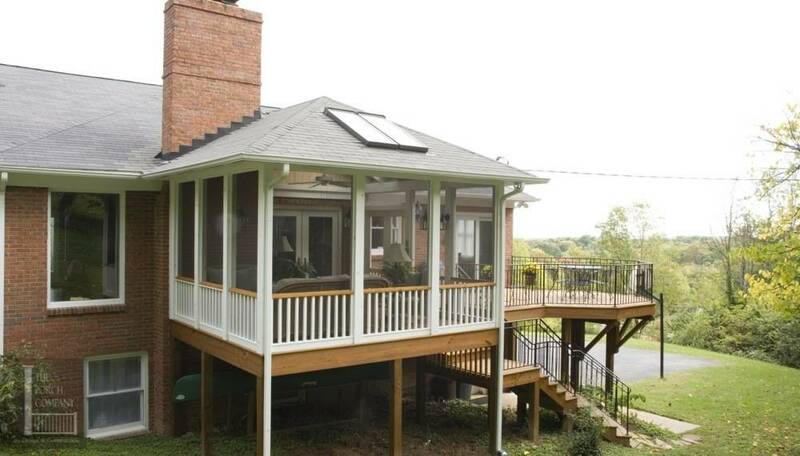 What’s more, a covered porch can even lower your energy consumption, especially during the hot summer days! Covered patios attached to house are such a delightful retreat. It can serve as an extension of our living room where we can entertain friends or spend quality time with our loved ones. You can equip it with comfortable lounge chairs, tables and perhaps, a ceiling fan. Basically, building a covered porch in your home is like adding another room to your house, a special place where you can relax and watch the world go by. If all these benefits of having a covered porch excite you, then here are some of the most inspiring covered porch designs to consider for your home. Country style decorating is often about comfort and charm. 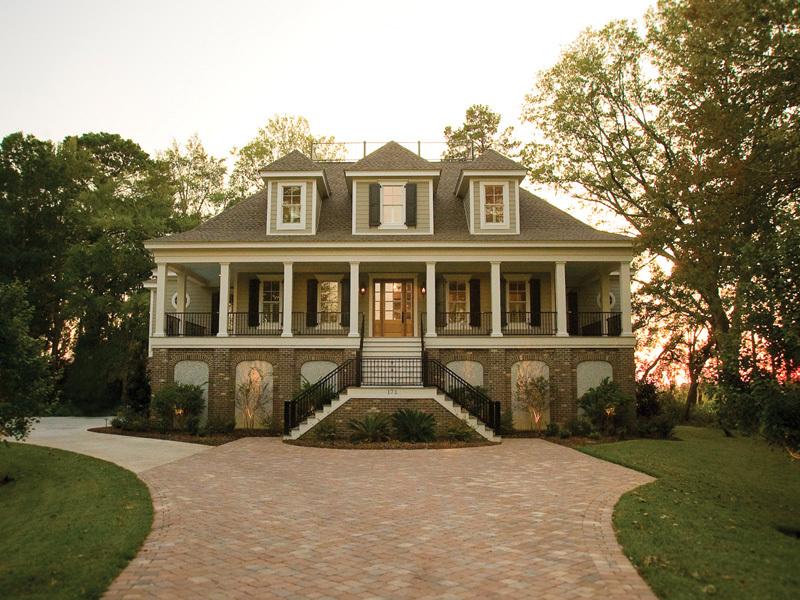 Elegant yet informal, this design is one of America’s most popular house designs. In fact, a country house plan is a broad genre of architectural design, which is also reflected in several other home plan designs and floor plans. It overlaps with the style of a farmhouse, cabin and cottage house plan. 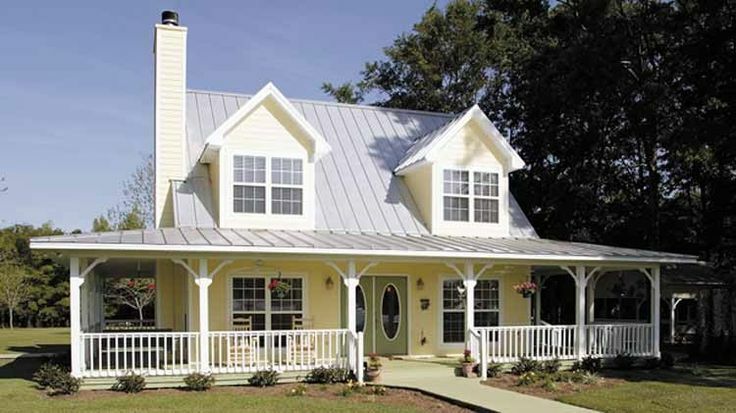 If your home is designed in country style, then understandably, your covered porch should follow the same thing. Combining the design principles of beauty and functionality, country style covered patio ideas have greatly evolved in the recent years. Gable roofs are pretty common although other designs consist of flat roof and other roofing styles. You can choose to have the porch built in the front, in your backyard or as a wraparound. Country style covered porches often have elaborate designs, serving as a functional transition space from the indoors to the outdoors. They often feature exquisite woodworking details, which greatly enhances your home’s curb appeal. If you need inspiration in coming up with a country style covered porch, here are some ideas to check out. 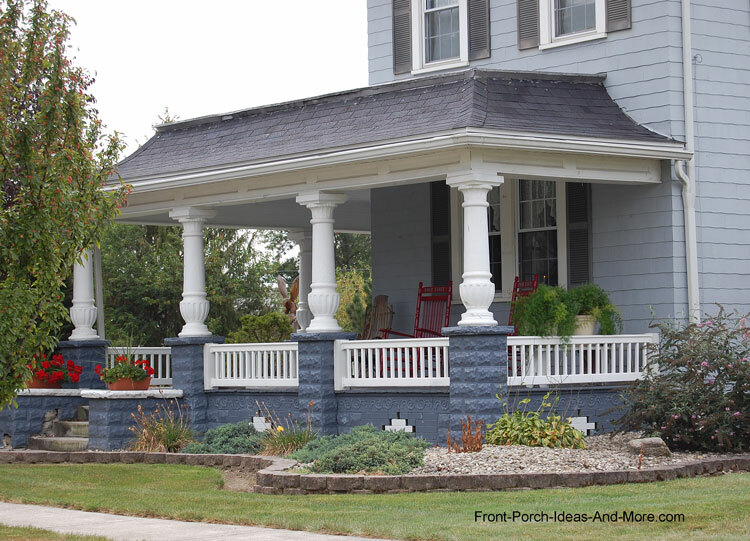 Typical open country style porch with stately porch columns. Country style covered porch with beautiful railings. Country style wrap around covered porch. Lovely wraparound porch with roof. Beautiful covered porch in a ranch style home. Wrap around covered porch in Victorian style house. There are many benefits that come with choosing pavers for your porches. They do not get worn out easily even if they’re exposed to constant moisture. The pavers are available in a wide range of styles and colors and they are extremely low maintenance. Regardless of the style or color that you will go for, the pavers can greatly help to enhance the overall aesthetics of your porch and your home as well. Unlike the wood covered patio, there will be no staining or painting required with pavers. They could keep their original color even for decades! Above all, they will not warp or rot and could last for a very long time. To make the porch look more spacious, extend the visual line of your home by installing the same pavers at the walkway leading to your porch. If a complementary color is not close enough, the best option is to opt for blended colors. Remember that any home exterior, regardless of the color, can be possibly matched or complemented with the use of brick pavers. Wood looking pavers are the best alternative for those who want to keep the wooden look of their wood covered patio. If you want a more modern look, you can opt for a distinct pattern or inlay. Check out these covered porch designs with pavers for more design inspirations. Rustic style paver covered porch. Paver covered patio with beautiful views. Covered porch with fire pit and paver floors. Small covered porch with pavers. Covered porch with paver floors in a bungalow cottage. Only a few modern homes come with porches. 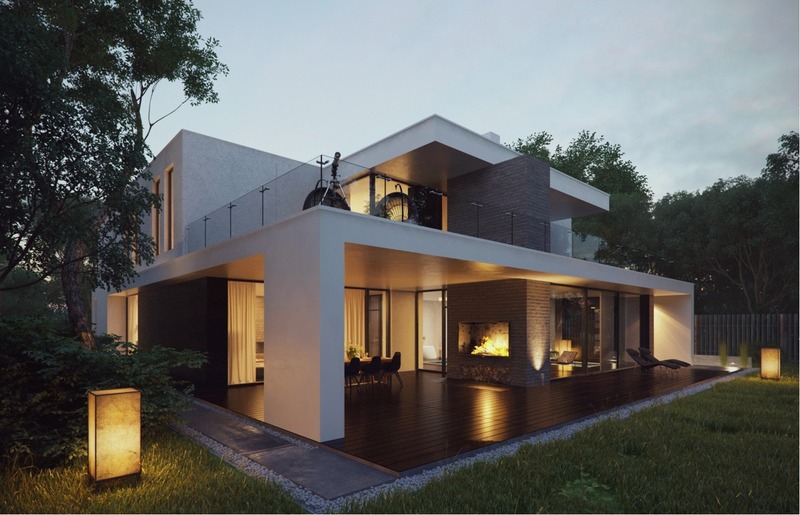 If done right, adding a covered porch in your modern designed home can actually help to enhance the overall curb appeal. Of course, the porch can also serve as an extension of your living room especially during summer when it gets too hot to stay inside. A modern home requires a modern covered porch. Whether it is a front porch or a backyard porch, modern covered porches usually feature symmetrical design elements that are aesthetically pleasing to look at. 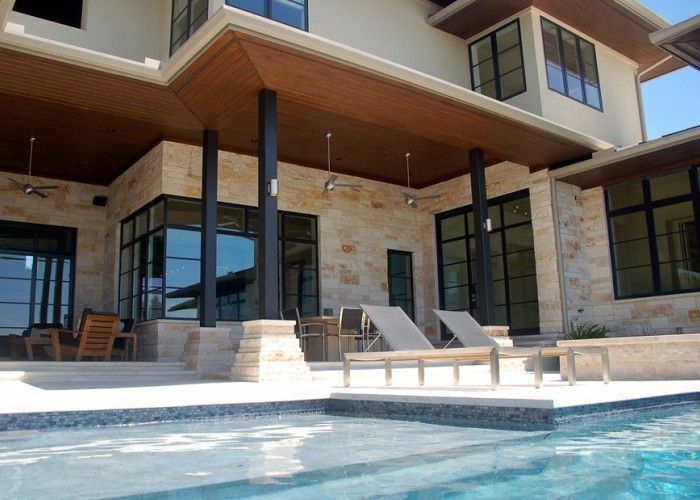 Although modern designs are often about the use of stark colors and predominantly neutral shades, warm and earthy colors can also be used for your modern covered porch designs. If you’re thinking of building a new porch or remodeling an existing one, take a look at these pictures of modern designed covered porches for ideas. Although most of these are covered patios attached to house, you can also come up with a modern porch or patio that’s separate from your home structure. Modern designed backyard covered porch. Contemporary designed covered front porch. One of the best places to spend lazy summer afternoons at home is at a covered porch. But sometimes, the presence of mosquitoes and bugs could ruin an otherwise perfect day. The best solution to this is to screen your porch. Screened porches will not only drive those insects away, but they can also help to make your porch feel more comfortable and warm especially during the cold winter months. Screening your porch is not an easy task so it may be best to hire a professional to do the job. Professional remodelers can also suggest some stylish screened-in covered patio ideas that can work well for your home. You can also opt for the old fashioned way which is to simply hang and staple a screen into the wooden framework of your porch. But if you want a stylish and professional looking screened covered porch, better leave the job to professionals. Once your screened porch is finished, consider fitting it with the right furniture and accessories. Look for comfortable lounge chairs, or perhaps a loveseat. If you plan on serving meals in your porch, place a low side table as well. For more ideas on how your screened covered porch should look like, check out these covered porch designs. Screened porch with glass windows. If you have a two-story house and you need more space for entertaining guests, eating al fresco or just a place to relax and enjoy the sunshine, then building a raised covered porch would be a great idea. The porch can either be on the front, at the back or can be wrapped around the entire house. 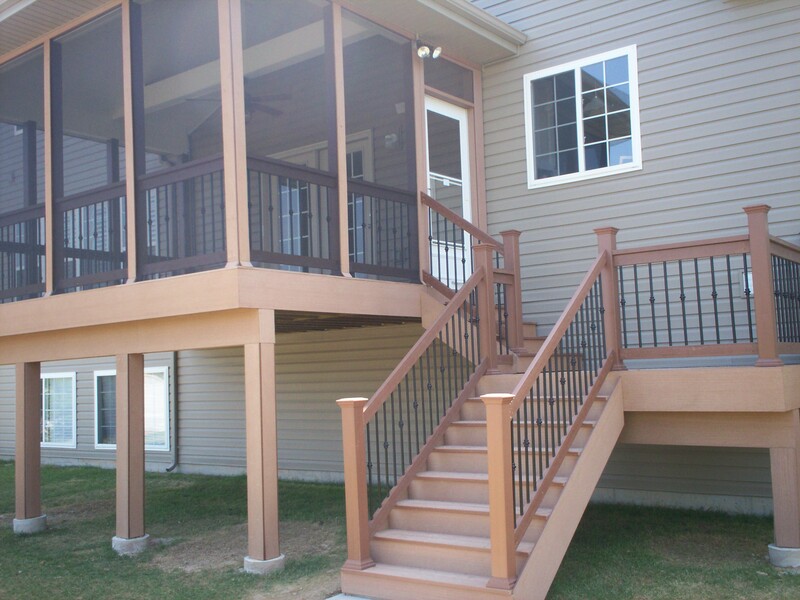 Building safe and secure stairs is very important for a raised or elevated porch. Sometimes, the porch may also come with an open deck so you’ll have a place to go to if you need a bit of sunshine. You can also choose to build the porch on top of a garage or you can have two-story porches so you will have plenty of space to move around when entertaining guests. It’s also a great idea to screen your raised covered porch. Others would even choose to have glass walls installed. Unlike a flat covered porch, building a raised covered porch is more complicated. Thus, this project is best left to the professionals. It can be more difficult if you plan on building two-story porches. If you are thinking of having a raised covered porch built, check out these ideas for your inspiration. 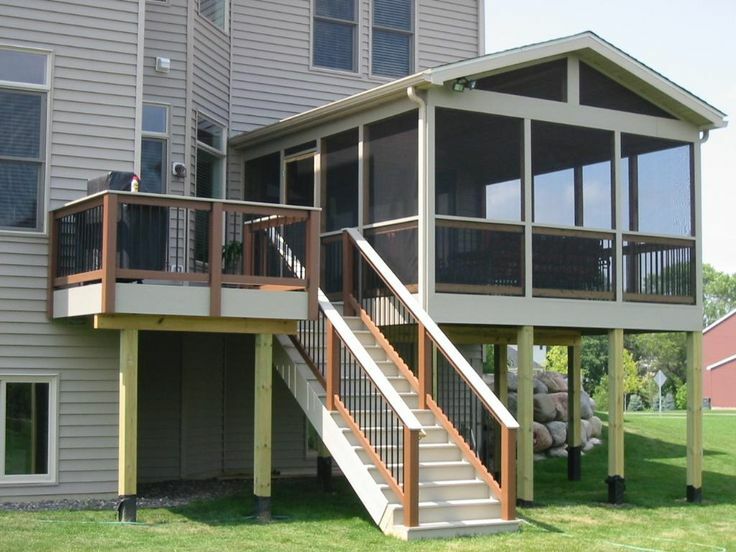 Raised covered porch and deck. Second story screened covered porch. Raised timber deck and screened porch. Raised low country style home with covered front porch. Raised covered porch with composite decking. Wrap around elevated covered porch. 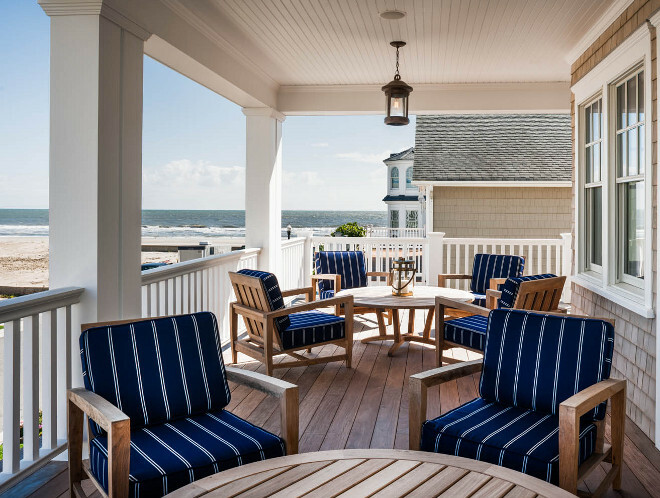 What better way to enjoy the gorgeous coastal views of your beachfront home than from a covered porch or patio? During summer, most people would often head to the beach, but if you’re lucky enough to live on the beachfront, then all you need is a comfortable covered porch. 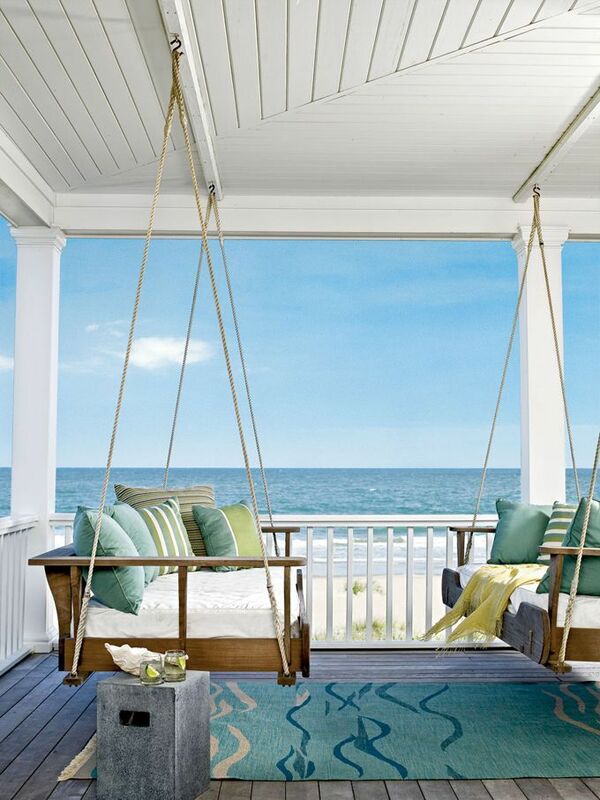 A beach-inspired porch is ideal for beach houses or holiday homes that open up to the gorgeous views of the sea. You can use any covering for your beachfront porch. It can be in the form of a tent or a sunroof. Make sure you decorate the space with beach inspired furniture such as a seating area made of rattan. Place stylish tables and chairs, and you now have a comfy and relaxing place to enjoy the stunning outdoor views. You can also decorate with beachy accessories, such as starfish, corals, and shells at the tables. These accessories can help to create a coastal atmosphere on your covered patio or porch. 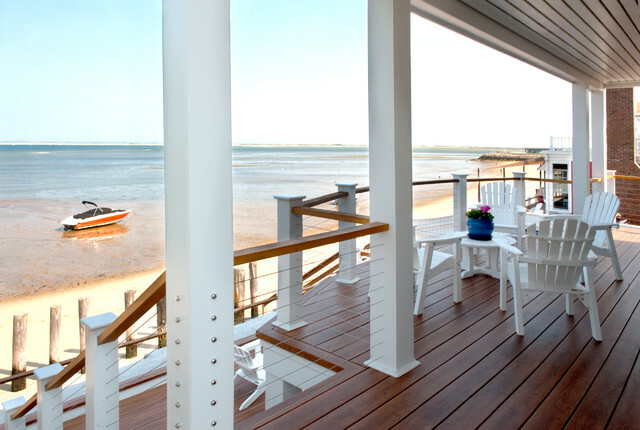 To give you more ideas, here are some of the most beautiful covered porches in a beach house. Elevated front porch in a beach house. Cozy covered porch by the beach. Beach house covered patio with furniture. It’s always a good idea to cover your porch. This is to protect the space from the harsh outdoor elements. If you plan on building a covered porch in your home or perhaps you want the existing porch to be renovated, these covered porch designs can be a great inspiration for your home improvement project.